The TGSM trailer on display at Heinz Field - home of the Pittsburgh Steelers - for the 26th Annual ALSD Conference and Tradeshow. 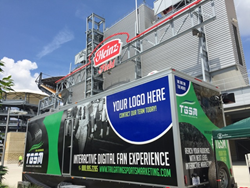 Many NFL, collegiate teams, and NASCAR track representatives were excited to step inside and experience the total fan engagement experience for themselves. Tailgating Sports Marketing (TGSM) recently participated as an exhibitor in the Association of Luxury Suite Directors’ 26th Annual ALSD Conference and Tradeshow. The event was held June 26-29, 2016 at the Wyndham Grand Hotel in downtown Pittsburgh, PA. The conference’s mission is to “create a community for professionals in the premium seating industry.” The tradeshow hosted over a 1,000 attendees and featured over 90 exhibitors; TGSM was the only outdoor exhibitor. ALSD connects premier seating executives within the industry, revealing the latest innovation concepts, technology, services, and products for an outstanding fan experience. Tailgating Sports Marketing drives revenue amplifying fan engagement, creating the ultimate fan experience, increasing overall ticket sales and purchase, and benefiting sponsors/advertisers with an 89% retention rate. During the 2015 NFL season, Tailgating Sports Marketing provided an interactive restroom trailer to a major NFL team for all of their home games and extra events. The goal was to improve the overall fan experience and venue marketing. During the NFL season at the new tailgating zone, Tailgating Sports Marketing provided important and valuable analytics to the venue demonstrating the increase in female fans. Several key team members from Tailgating Sports Marketing participated in the ALSD show to work the trailer unit, as well as a booth inside the exhibit hall. The attendees were educated on the trailer’s technology and how to use it to improve their venue marketing and fan experiences. Most importantly, TGSM connected one-on-one with ALSD attendees to better understand their fans’ needs and to partner with solutions. The digital interactive gaming luxury premium restroom trailer was displayed in three locations throughout Pittsburgh, Heinz Field – home of the Pittsburgh Steelers – the Wyndham Grand Hotel in downtown Pittsburgh, and PNC Park - home of the Pittsburgh Pirates. At each location, attendees were able to see how the trailer will bring a new level of fun and luxury to their Fan Experience. The attendees raved about the interactive gaming in each restroom stall, the 72” video/screens, sponsor messaging in the disappearing mirrors, and music video screens on all exterior restroom doors. The favorite were the interactive urinal games, where men compete for the best score with downhill skiing or a racing game. For more information on the interactive restroom trailers from Tailgating Sports Marketing or the company’s participation in the 26th Annual ALSD Conference and Tradeshow, please contact our team at 888-995-2285. Tailgating Sports Marketing is a subdivision of Portable Restroom Trailers, LLC located in Lake Wylie, South Carolina. Lake Wylie is located outside of Charlotte, North Carolina and is only 1-hour north of Columbia, South Carolina. The division was established to provide stadiums, festivals, tailgating associations, concerts, and other events a fresh alternative to temporary restroom facilities. TGSM offers a state-of-the-art, fully interactive restroom trailer designed as an interactive engagement activation experience. Restrooms feature HD digital displays, interactive media display triggers, and mobile device gaming. Aimed at providing guests an unforgettable, comfortable and unique restroom experience, the units are also lucrative revenue opportunities for venue owners, sponsors and advertisers. For more information, visit ww w.TailgatingSportsMarketing.com.